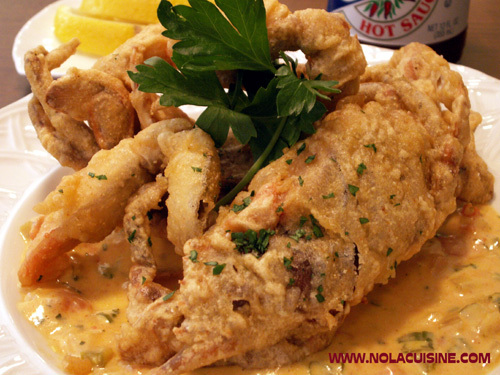 The most popular way soft-shell crabs are prepared in Louisiana is fried, and for good reason, they’re good that way! A good tip is to make sure that your batter is not too thick because the crabs will never get crispy, your batter should be like a thin pancake batter. buttermilk – enough to make the crab batter the consistency of a thin pancake batter. Heat the peanut oil to 360 degrees in a Dutch oven. The oven should be large enough to have the oil about 3 to 4 inches deep and halfway up the sides of the pot. When the oil is hot, dredge the crabs in the seasoned flour, shaking off any excess, then dip into the batter. Be sure to completely coat the crabs and let any excess drip off. Carefully place the crabs into the oil upside down (this will make the claws stand up a bit for presentation). Fry only two at a time – maximum, until they are golden brown and they float to the surface. Be sure to let the oil heat back up before frying the next batch. A tip, soft-shell crabs have a tendency to spit hot oil, or pop when the inside liquids heat up, so be careful. Serve the crabs on a plate covered with the Creole choron sauce (see recipe below), lemon wedges and hot sauce on the table. corn starch slurry (2 tbsp. corn starch mixed with 2 tbsp. water) or dark roux, depending on the dish. Heat the oil over medium heat, add the bell pepper, onion and celery, and saute until slightly wilted. Add the garlic and tomatoes and cook for about 1 to 2 minutes. Cover with the stock by a half inch, add bay leaves and a small amount of seasoning. If using roux, add it at this point. But not too much, maybe 1 to 2 tablespoons. If it gets too thick, add a little more stock or water. It should be loose but not too watery. Simmer about 20 minutes. Add the other seasonings and hot sauce to taste. Add the Worcestershire sauce, parsley and green onions. If using the corn starch slurry, bring to a boil then add the slurry, a little at a time until it is the right consistency. It should be tight, but not watery. Not too thick, not too thin. Heather R. Breaux at heatherb@heraldguide. Include your name, address, phone number and a photo of your completed dish along with the recipe.